Computationally-intensive tools play an increasingly important role in financial decisions. Many financial problems—ranging from asset allocation to risk management and from option pricing to model calibration—can be efficiently handled using modern computational techniques. Numerical Methods and Optimization in Finance presents such computational techniques, with an emphasis on simulation and optimization, particularly so-called heuristics. This book treats quantitative analysis as an essentially computational discipline in which applications are put into software form and tested empirically. This revised edition includes two new chapters, a self-contained tutorial on implementing and using heuristics, and an explanation of software used for testing portfolio-selection models. 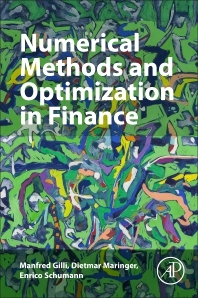 Postgraduate students, researchers in programs on quantitative and computational finance, and practitioners in banks and other financial companies can benefit from this second edition of Numerical Methods and Optimization in Finance. Manfred Gilli is Professor emeritus at the Geneva School of Economics and Management at the University of Geneva, Switzerland, where he has taught numerical methods in economics and finance. He is also a Faculty member of the Swiss Finance Institute, a member of the Advisory Board of Computational Statistics and Data Analysis, and a member of the editorial board of Computational Economics. He formerly served as president of the Society for Computational Economics. Dietmar Maringer is Professor of Computational Economics and Finance at the University of Basel, Switzerland, and a faculty member at the Geneva School of Economics and Management. His research interests include non-deterministic methods such as heuristic optimization and simulations, computational learning, and empirical methods, typically with applications in trading, risk, and financial management. Enrico Schumann holds a Ph.D. in econometrics, an MSC in economics, and a BA in economics and law. He has written on numerical methods and their application in finance, with a focus on asset allocation. His research interests include quantitative investment strategies and portfolio construction, computationally-intensive methods (in particular, optimization), and automated data processing and analysis.